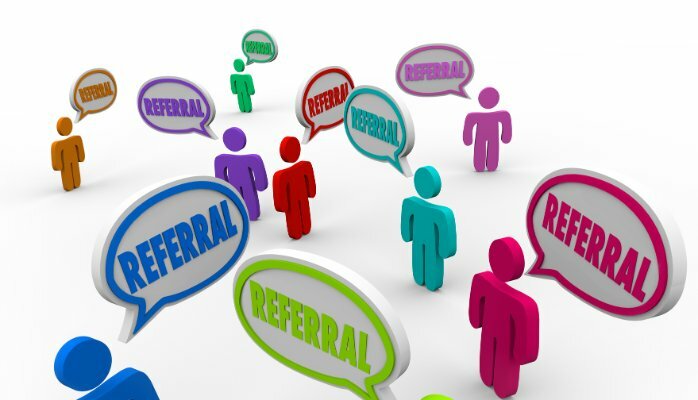 Did you experience that if someone you refer to us enrolls, then we will reward you? Now whenever you invite your friends, family or co-workers to Invoicera, you’ll earn 30% recurring earnings every time your referral purchases/renews his/her plan for lifetime. Wouldn’t it be nice to take a perks for yourself? With a valuable amount of effort, Invoicera affiliate program can be a great source of extra income. 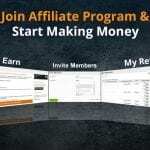 This affiliate program pays cash. It’s an incredible program for those who want to earn endlessly by endorsing Invoicera. The beauty of this program is that it doesn’t stop. In other words, this classic flywheel effect lets customers earn more and more profits. This is an exciting time to initiate, measure and optimize your choice. Get rewarded for sharing and referring friends now! How The Referral Program Works ? We’ve found the recurring revenue model to be a great fit for our business. Customers pay us every month to use our application. We felt it was fitting that anyone who referred a paid customer our way should also earn a piece of that recurring earnings. So that’s what we’ve done. For each paid sign up done through your referral link, you would be eligible to earn 30% recurring earnings every time your referral renews his/her plan. 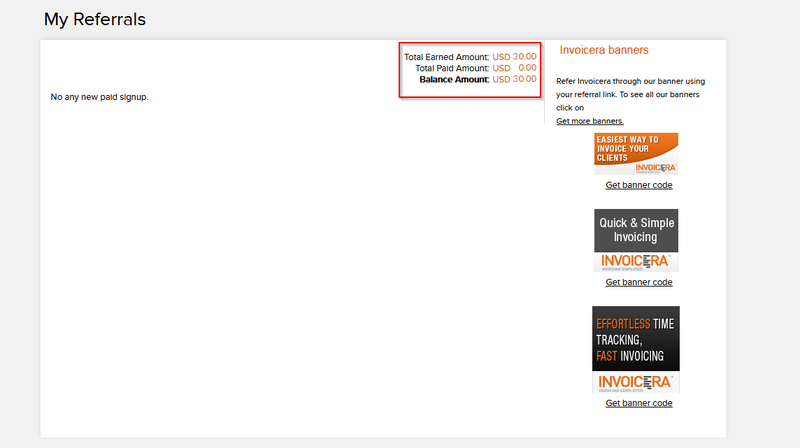 In order to become our affiliate, you must be an active Invoicera user. 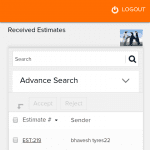 If you haven’t subscribed to Invoicera yet, then sign up now and get your account instantly. It’s Free. 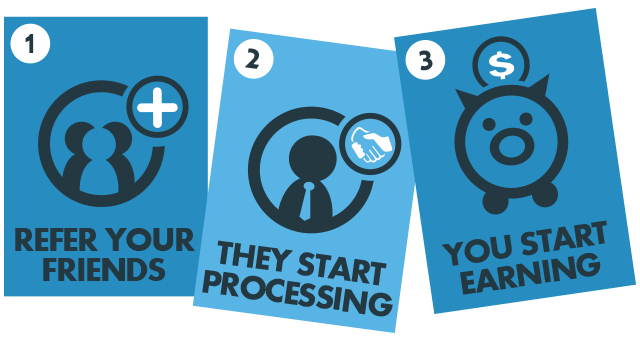 The more you refer Invoicera, the more you get the chance to earn more. For each paid sign up done through your referral link, you would be eligible to earn 30% recurring earnings every time your referral renews his/her plan. You would also have a good chance to earn from the free plans as well. If someone sign ups for a free account through your referral link and then upgrade to Invoicera’s any of the paid plans, you would also be eligible to earn 30% recurring earnings. So you will have a great chance to earn more by referring Invoicera. 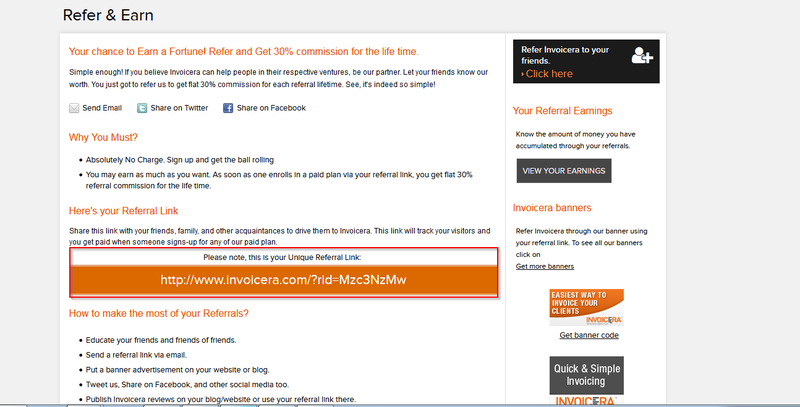 Just refer Invoicera and get rewarded with 30% commission every time your referral renews his/her plan . Also, once you log in to your account you will be able to instantly view how many people have taken up our offer of a free trial and how many have signed up for our paid plans. Here, you can track your recurring earnings in real-time. We fully expect that you will ultimately be able to make nice livings off referring Invoicera application through the Affiliate Program. 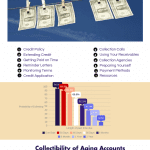 The income you can make off the recurring revenue model will really begin to add up. We’re excited to see where this goes. Both your customer and her/his friend are on the way to something great. This is the time to capitalize on that thrill and share excitement. Anytime is a good time to listen from a friend. But when there is a same reason for which the contact is shared, it is more likely to act on the impulse to express the common interest. Step 2: Click on “Refer & Earn” section in the footer. 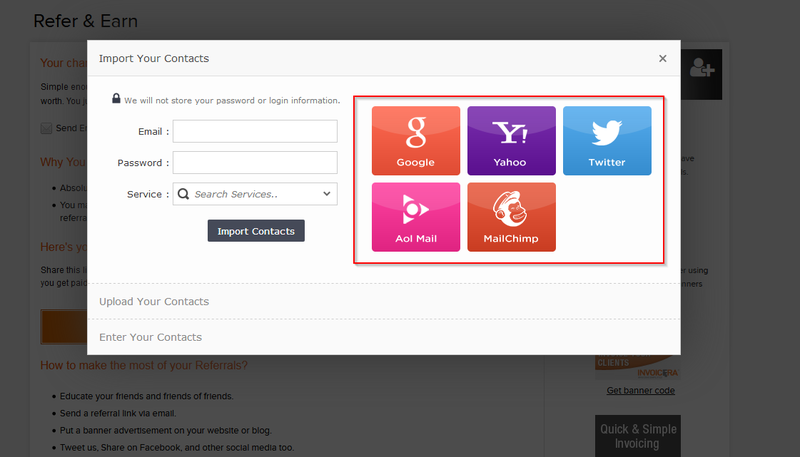 Step 4: Start referring Invoicera to your friends, business contacts etc. via email, twitter, facebook plus banners you can post on site or blog. 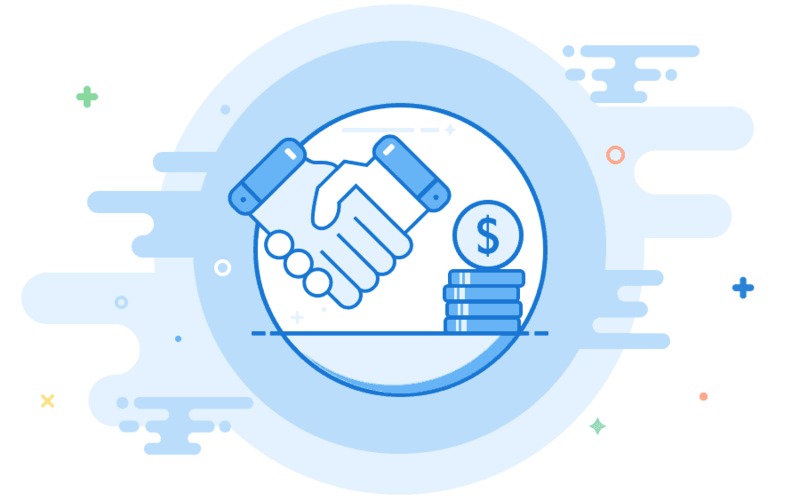 Why should you partner with Invoicera? 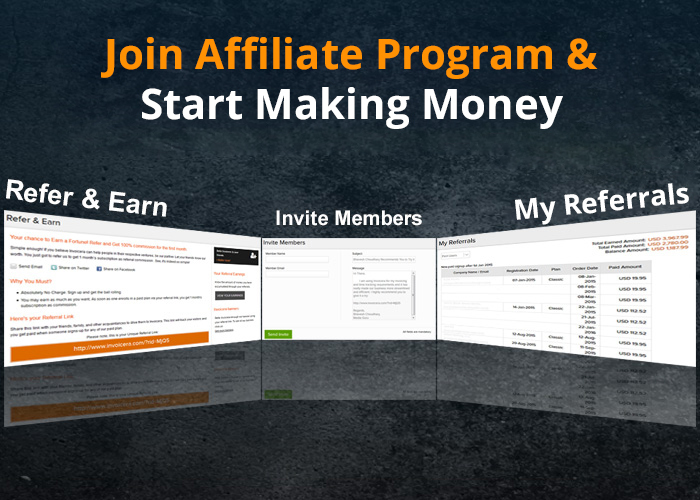 Join our highest paying affiliate program now and earn 30% referral income each time you refer or your referral renews their plans. Our competitive conversion rate helps to gain maximum profits. The amazing affiliate program that allows you to shape customer experiences without making any efforts. 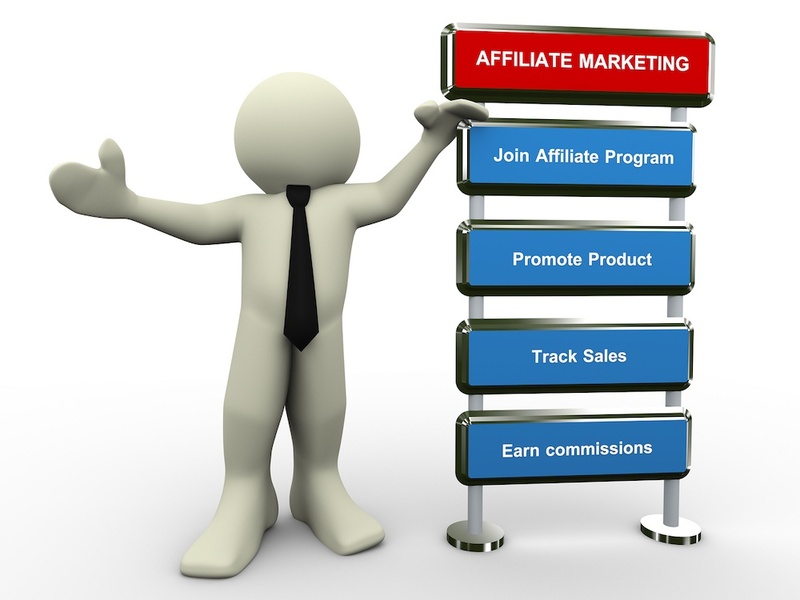 So become an affiliate today to get a much better chance of recurring earning if you treat it like one! It’s free and easy to join.